This article first appeared in Personal Wealth, The Edge Malaysia Weekly, on June 12, 2017 - June 18, 2017. Asian stocks are poised to continue their outperformance in the next six months amid uncertainties in other regions. China, South Korea and Taiwan are expected to play a big part of this growth. Future drivers such as the One Belt, One Road initiative may lead to even stronger returns. Asian equities will continue to outperform in the second half of the year, due to accommodative monetary policies, robust consumption in domestic demand, strengthening currencies and progressive opening of trade channels in the region. According to an economist and investment experts, future drivers such as China’s One Belt, One Road (OBOR) initiative may lead to further growth in the region, including Malaysia, resulting in better prospects for investment returns going forward. Danny Chang, head of managed investments and product management at Standard Chartered Bank (M) Bhd, says the bank will continue to favour equities in the region, especially with the market leaning towards a growth scenario. “In general, Asian companies have been producing capital gains of 2% to 3% this year. Including dividends, these assets have provided returns of almost 10%. Because of this, we are still overweight on Asian equities. “India outperformed in the first half of the year, therefore we have taken the gains off the table and are now biased towards Northeast Asia, towards countries with strong technology industries, such as South Korea, Taiwan and China. Asian equities have done well in the past six months. According to Bloomberg data, the India NSE Nifty 50 Index, Taiwan Stock Exchange Weighted Index, Shanghai Stock Exchange Composite Index and South Korea’s Kospi Index had risen 19.07%, 23.54%, 7.90% and 21.50% respectively over a one-year period as at June 6. Economies across Asia have been healthy in the past 12 months, with the Purchasing Managers’ Indices of India, Taiwan, China and South Korea at 54.4%, 52.2%, 51.2% and 49.4% respectively as at April 17. In 2013, China President Xi Jinping proposed the OBOR initiative as a new economic framework that would connect the country’s Silk Road Economic Belt project in Central Asia with its Maritime Silk Road through bodies of water. Spanning more than 68 countries, the initiative represents 40% of global gross domestic product and involves more than 60% of the world’s population. According to a May 15 report by UK-based specialist investment banking provider Exotix Partners, the OBOR initiative will potentially create sustainable demand for Chinese goods, which could help underpin its economic growth and foreign exchange rate in the long term. The initiative will also undoubtedly improve access to capital for countries with underdeveloped political and economic governance, such as those where sufficient domestic and foreign capital have not been mobilised to construct and maintain adequate public utility infrastructure. On May 14, China hosted the OBOR summit, calling for investment and support from Asean countries. Although it may not be immediate, the initiative will benefit assets in the region, among other positive implications, says Chang. Lim Suet Ling, executive director and CEO of UOB Asset Management (M) Bhd (UOBAM), cites Thailand, Indonesia and Vietnam as some of the key beneficiaries of the OBOR initiative. “These countries will experience improvements in their everyday life as sectors such as utilities, sanitation, transport, education and tourism gain from the opening economy. China has committed RMB780 billion (RM490 billion) via state funds and banks for the first stage of the initiative. Lim says that the country wants to continue using the renminbi in the initiative as an attempt to internationalise the currency. “Currently, projects are being evaluated and there will be a call for tenders to start building the infrastructure. That is where the companies of different countries, including Malaysia, will bid for projects. When we get the projects that we bid for, they flow to the bottom line. But this is something that will take time, spanning years of development before we can see the impact,” says Lim. According to an estimate by the Asian Development Bank, the OBOR initiative will need an annual infrastructure investment of US$1.7 trillion until 2030. Lim says as long as there is investment in the region, jobs will be created, giving people in countries such as Bangladesh and Pakistan a higher quality of life. This will have a multiplier effect on consumer discretionary products in the region. From a global perspective, financial markets around the world have been leaning towards a reflationary scenario since January, and there is a possibility that the markets may go back to the structurally low-growth scenario, also known as the muddle-through scenario, says Chang. “Most of the soft economic data such as consumer and business confidence seems to be supporting the reflation scenario coming true while only some of the hard economic data such as US jobs are supporting it, to some extent. That is why investors need to be mindful that there are economic data suggesting the possibility of a return to the muddle-through scenario or hanging in between these two scenarios,” he adds. Lim concurs, saying the data point towards a stalled reflation scenario. However, to take advantage of it, she says investors should go for earnings per share growth in equities instead of focusing on fixed income, which is currently providing low interest rates. “At one point in the past 12 months, the 10-year US Treasury rate went to a high of 2.6% to 2.7%. The market was expecting it to reach 2.9% if there was a pickup in inflation, but now it is hovering at 2.2%. It is very low and the yield curve is flat. While it is not showing recession, it is showing a stalled reflation,” says Lim. “On the flip side, the earnings yield is growing around 5% to 6%, with the spread close to 400 basis points. As much as bonds are a safe asset with lower volatility, investors need to ask themselves whether it is worth the allocation with just over 2% interest rate. What they can do instead is look for equities that give higher income. This year, global activity has improved amid a cyclical recovery in trade. According to an April 12 report by the World Trade Organization, global trade will likely expand within a range of 1.8% to 3.6% this year, compared with a very weak 1.3% last year. Investments have risen following more upbeat business sentiment and improved corporate profits and industrial activity. In the US, markets have dialled back expectations of President Donald Trump’s ability to carry out his policy reforms. According to Julia Goh, economist at United Overseas Bank (M) Bhd, the year started full of enthusiasm for a stronger US dollar against a backdrop that the Federal Reserve will continue its well-communicated policy normalisation of a few interest rate hikes during the year. “However, as the year progresses, things have continued to be increasingly challenging for Trump as his administration is increasingly distracted by political troubles while making little headway into tax, infrastructure and other fiscal reforms. As a result, the dollar has pared all of its post-2016 US presidential election gains,” she says. Due to the lack of concrete details regarding Trump’s fiscal measures, the US Dollar Index fell to its lowest year-to-date (YTD) level in April. In a May 26 report by Rabobank Financial Markets Research, political scandal surrounding the US president, the difficulties associated with the passage of healthcare reform, the lack of details in the tax reform proposal and the White House’s budgeting errors have all sapped the belief in the administration’s ability to boost economic growth, souring the dollar’s outlook. Although the Trump administration is expected to eventually get some of the expansionary economic and fiscal policies approved, the timeline is highly uncertain and delayed, says Lim. “Our current view is if Trump is going to push for anything, it will most probably happen by the end of the year or next year. “Going forward, market sentiment and currencies may still be swayed by the Fed’s tapering of its more than US$4.5 trillion balance sheet. While it depends on what Fed chair Janet Yellen announces, we are seeing the central bank’s reaction as very conscious of its impact on the market. Goh says fears of political and economic uncertainty in Europe have been eased by the victory of centralist Emmanuel Macron in the French presidential election. The eurozone is seeing more support from investment and consumption while the unemployment rate has fallen to an eight-year low — giving a boost to the region’s sentiment. In the second half of the year, there are Germany’s and Italy’s elections to watch for, while the Brexit negotiations will officially begin after the UK election on June 8. “We are cognisant of the upcoming Italian election in 2018. Although the French election reduced the risk of euro-sceptic parties assuming power, the Italian polls remain due next year and are still uncertain. Italy is the next hot spot where the sceptics will focus on the potential of anti-establishment parties gaining popularity, resulting in anti-euro policies or moves,” says Chang. Meanwhile, Malaysia is seeing an improvement in its economic fundamentals, buoyed by strong domestic consumption and export numbers, says Gan. Despite the higher inflation and high household leverage, the country saw robust private consumption in the first quarter of the year, growing 6.6% year on year, he adds. “We think the markets are also bracing for a pre-election rally in the country and could see more pump-priming ahead of the 14th general election. We expect the FBM KLCI to breach 1,800 points by year end, if not higher,” says Gan. The FBM KLCI closed at 1,788 points on June 6, having risen 12.18% over a one-year period and 9.09% since the start of the year. “The index was charging towards an all-time high of about 1,900 points in 2014 before the collapse in oil prices. We would only turn more cautious when the election is called as there is no certainty that the positive economic agenda, moderate politics and anti-corruption drive will be carried through after the election,” says Gan. Meanwhile, the ringgit has strengthened over the past few months, riding the weakening US dollar and upswing in sentiment on the local currency. According to Goh, the ringgit’s strength can prevail if the risk sentiment remains positive and inflows sustain, which could translate into higher or stable foreign holdings of Malaysian equities and bonds. “We had some initial reservations surrounding the impact of the Fed balance sheet reduction on the US dollar and Asian currency movements. 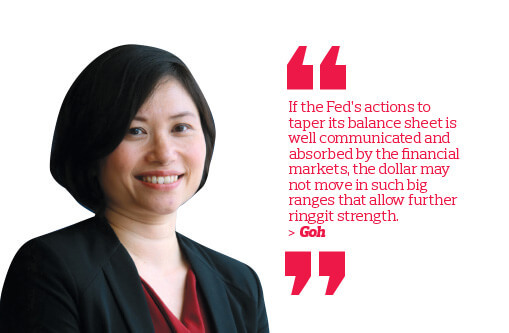 However, it appears that if the Fed’s actions to taper its balance sheet are well communicated and absorbed by the financial markets, the dollar may not move in such big ranges that allow further ringgit strength,” she says. After three years of anaemic results, the return of growth has resulted in money flowing back into equities globally. With the rise of animal spirits in the markets and easing of fears over the US political turmoil and French and Dutch elections, stock markets across the globe rallied, with the FTSE 100, Germany’s Dax and S&P 500 reaching record highs in the past 12 months, says Gan. Meanwhile, investors of high-yield bonds have made good returns over the past 12 months, earning more than 10% in capital gains and coupons. In the coming year, however, the capital gains will be harder to come by, says Chang. “The current spread for bonds is still very tight. Investors will most likely be clipping coupons in the next 12 months. However, not all bonds are created equal. While investors may want to avoid long-dated government bonds, they may want to look at shorter-term US dollar emerging market (EM) sovereign bonds, which are currently suggesting value,” he says. In terms of commodities, UOBAM currently has a positive outlook on crude oil, says Lim. Citing analyst views, she says there is a chance for the commodity to move towards US$60 per barrel from US$47 currently. “Opec just agreed to reduce production in April. As crude oil takes about 53 days to reach the US storage, the deficit in supply and demand will result in inventory drawdowns in the US in the coming months. This will be reflected in the trading prices,” says Lim. Sector-wise, the banking sector in developed markets is looking attractive, with the possibility of a widening profit margin in the event of a rising bond yield curve. In Malaysia, the banking and property sectors are poised for a turnaround after recent lacklustre performances, says Gan. “Banks have embarked on aggressive cost-cutting exercises and we are starting to see the results this year, with a recovery in top-line growth and better earnings. Maybank, Hong Leong Bank and Public Bank posted good returns and we believe there is a potential rerating catalyst with the improving business environment,” he says. Meanwhile, in the local property sector, counters are due for a late cycle upturn after three years of softness, says Gan. Although not expecting significant price improvements, better sales volumes may be achieved in the coming months, he adds. “With the general election looming, we believe there is an incentive for the government to loosen lending policies, including the Real Property Gains Tax and stamp duties. This will give the sector a boost as 60% of household wealth is tied to property. 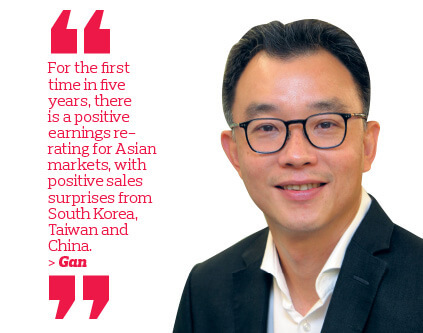 We think the downside is also limited as the prices of property stocks have not moved a lot and are supported by a 30% to 40% discount to their fair value,” says Gan. Other attractive sectors in the country include those that will benefit from election pump-priming such as consumer-driven sectors as well as those set to benefit from increased spillover investments from China, such as the construction sector. While defensive, non-cyclical sectors such as utilities and consumer retail may be ideal in a muddle-through environment, these sectors may not be very exciting in a growth-chasing scenario, says Chang. Lim concurs, saying that it is structurally very challenging for the defensive sectors to outperform in the current environment. Hedge funds are also an alternative investment to consider, says Lim. “These funds are meant for hedging. Therefore, they are a long-shot investment. While they are slow moving, they will give investors extra alpha. She adds that sophisticated investors may want to look at private equity and venture capital, which can give substantial returns. However, as the investments are highly risky and illiquid, investors should make sure they are comfortable with the fund manager’s track record before putting their money into any funds or companies. An interesting asset class that is underappreciated and may be worthy of a place in an investor’s portfolio is EM equities, says Chang. Asian equities, which have been doing well, are a significant component of EM equities, which include stocks in Latin America, the Middle East, Africa and Eastern Europe. “The divergence of equity valuations between developed market and EM equities is at its widest level in the past five years. Since the taper tantrum, EM equities have been neglected by investors. But now, we may see some value in EM equities. It is a contrarian idea, but if investors are willing to consider this, then it may prove to be an interesting diversification to their portfolios,” says Chang. “Having said that, clients should be rightsizing their portfolios. EM equities should not take up 50% of their allocation, but 15% to 30%. Additionally, to normal Malaysian investors, EM stocks may be an uncharted territory. Therefore, it is best for them to invest through a manager, perhaps through an ETF or managed fund, because that is significantly diverse.